There is a slight sadness to this autumn that I never imagined I would feel. This is the first autumn that I am not returning to a form of education since I was 4 years old. For me, autumn is so connected with the smell of sharpening pencils in a school classroom, stocking up on notepads and new highlighters, laying out my school uniform, and a certain sense of excitement over what was in store for me in the coming year. As I progressed into college and university, a lot of that sentimentality remained. I still found myself stocking up on new notebooks at the start of term and investing in new pieces for my autumn wardrobe to debut at lectures. Autumn and education are so interconnected in my mind that now that I am out of education, I don't quite know what to do with myself. Looking back, there are quite a lot of things that I wish I had done whilst I was still at university that I can't really do now. There are so many opportunities that I missed out on because I felt too shy to put myself out there and do them. I wish that I had kept in mind how university doesn't last forever and that I should make the most of it whilst I'm there. 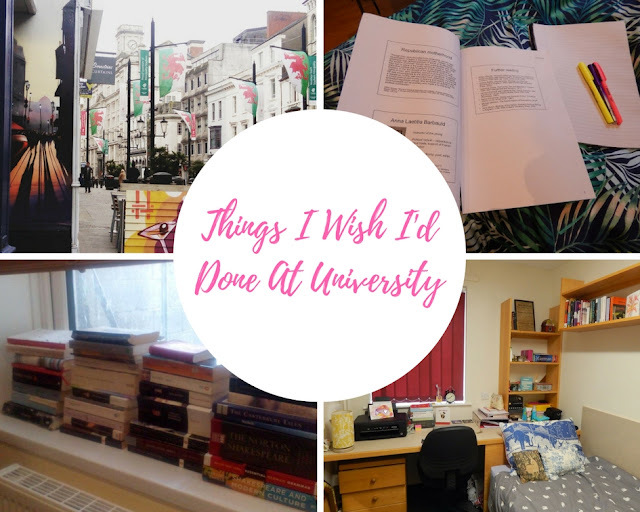 So, in an effort to encourage my student readers to make the most of their time at uni - and just to indulge in a bit of nostalgic reminiscing - I decided to put together a little list of all the things I wish I had done at university. At my university, the language department offered free language courses and you could also take a proficiency test at the end of it which gave you a qualification in that language. I did study German in the first year of uni but I dropped it when I went into second year. I did intend to do the free language course in German so I have at least something to show for it but I got a bit lazy and next thing I knew I was graduating. Lots of unis offer free language courses and they always have a wide selection to choose from - gone are the days of only having French or German to study. My uni offered everything from Russian to Japanese. Even if you don't become an expert, learning a few phrases is a lot of fun and a great thing to add to your CV (yes, I am aware I sound like a career advisor). They say that you don't appreciate a good thing until it's gone and that is definitely true of student discounts. I miss all the offers and savings to be had. I miss the cheaper rent. I even miss student loans and grants. Being a graduate is super expensive. So expensive that I think they should introduce a graduate discount system so you continue to have discounts for the first year after you graduate - just whilst you transition into a career and stabilise yourself. My uni was always running cheap trips to different places across the UK and the world. I wish now that I had taken advantage of the opportunity to travel so cheaply (and get out of some lectures). Looking back, I really didn't put as much effort into my studies as I could have done and I do regret that now. I think I would have found the course a lot more enjoyable if I had actually engaged with the books we were assigned more and put more hours into researching for assessments. I may also be a little bit bitter that I didn't achieve the 2:1 that I had hoped for. There is nothing I love more than reading a good old room tour post but they also make me wish I had put more effort into my own room decoration whilst at university. All the photo prints, motivational postcards, and posters I see adorning corkboards put shame to the timetable and print out of German verb conjugation that I had pinned to mine. I also feel like maybe I would have been more motivated to work if I had actually been able to use my desk rather than making it into a wasteland of dirty laundry, crumpled receipts, and seminar hand outs that probably should have been filed away. I feel like I could have been involved with so many more things and met a lot more people if I had joined societies. Some of my flatmates were involved with so many different things and they always seemed to be off out somewhere fun. I kinda wish I hadn't missed out on those opportunities myself. The amount of seminars that I attended on novels that I had not even opened is laughable - and kind of tragic. I feel like maybe I would have gotten more out of my university experience if I had actually engaged with the material I was meant to be studying rather than hurried searching the book on Wikipedia on the way to class. 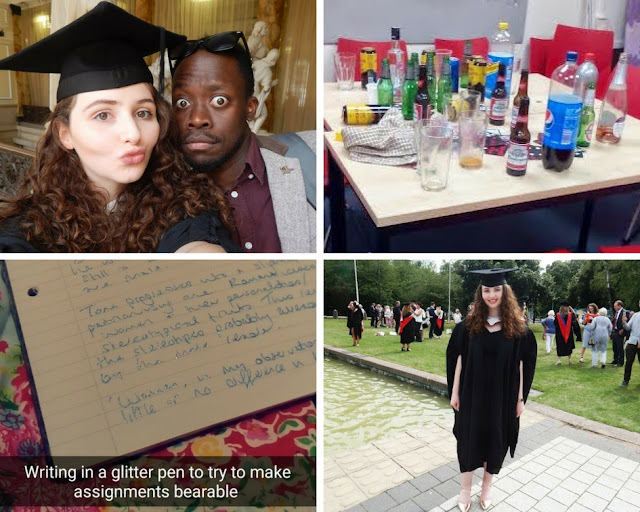 What would you do differently if you went back to university? Hopefully, I will be going Uni next year. Good to read your personal advice, hope it will help me a little!